As part of the GOANNA Project, in 2010 the LPLN appointed a Project Officer to collect mapping data on all of the environmental assets and potential threats they may face across the network area. The Project Officer liaised with member groups and individuals and mapped on-ground works that had not been previously captured by CAMS (Catchment Activity and Management System), the website used by the Victorian Government for recording environmental projects and tracking public investment. From this the Blueprint for Action was produced and will be used for planning future activities subject to funding. 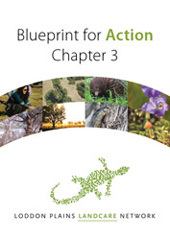 The Blueprint for Action will be shown as a ‘Business Model’ to potential public and private sector investors and demonstrates that the LPLN thinks strategically about landscape restoration and improving environmental outcomes. The Blueprint for Action is available for download below. To enquire about a hard copy contact our Landcare Facilitator.